FHA is a home loan program insured by HUD and in 2008, about a year after the real estate and the economy as a whole took a downward turn and Private mortgage money virtually disappeared from the industry, FHA’s market share of all insured mortgages soared to about 72% . In 2009 FHA accounted for 25% all home loan originations. Interestingly this trend has changed. In fact between 2010 and 2014 FHA’s market share fell by half when you measure in terms of total number of home units sold. Two things happened in 2010 and 2011 which exacerbated this trend. 1/ Cash investors were pouring into the housing market.
. . . and so homebuyers looked to loans other than FHA to purchase homes. Comparing FHA as a mortgage insurance to other mortgage insurance/guarantee options including Conventional PMI and VA (VA has no annual mortgage insurance but offers loanguarantees), it’s clearly that as time passed between 2009 and 2014 FHA’s 1.35% per annum mortgage insurance was considered expensive. In 2014 the PMI companies were generally offering mortgage insurance at cheaper rates than FHA. But with Obama announcing a drop in FHA’s annual mortgage insurance in Jan 2015, things may bounce back for FHA. 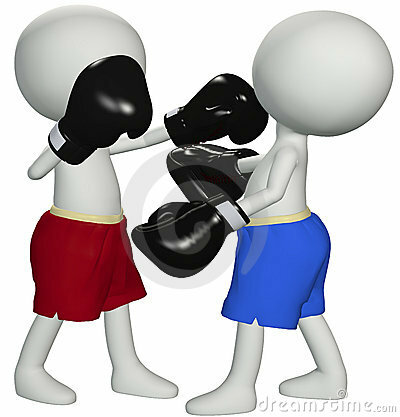 Let’s line up Conventional versus FHA financing for a 95% Loan-to-value home purchase of $300,000. 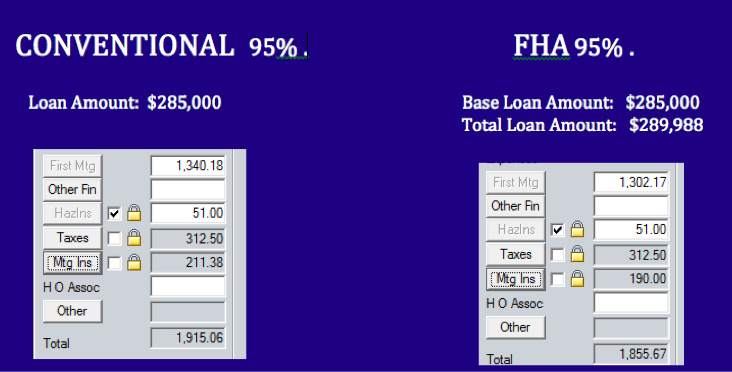 Dowmpayment: 5% (95% Loan to value) –Note: FHA loans can go to 96.5% but for this comparison we will use 95%. Take a look at the payment and loan amount comparison below. For many buyers, such as for example those who have Bankruptcies less than 4 yrs old, Conventional may not even be an option, Those buyers are forced to go FHA . . but as you can see below, it may not be as bad if you can contend with the two disadvantages we just described. And here’s some good news for buyers. The UFMIP can eliminated by means of a slightly higher interest rate which produces sufficient Lender credit to ‘buy out’ the 1.75%. in that case the FHA loan amount becomes exactly 95% of $300,000.